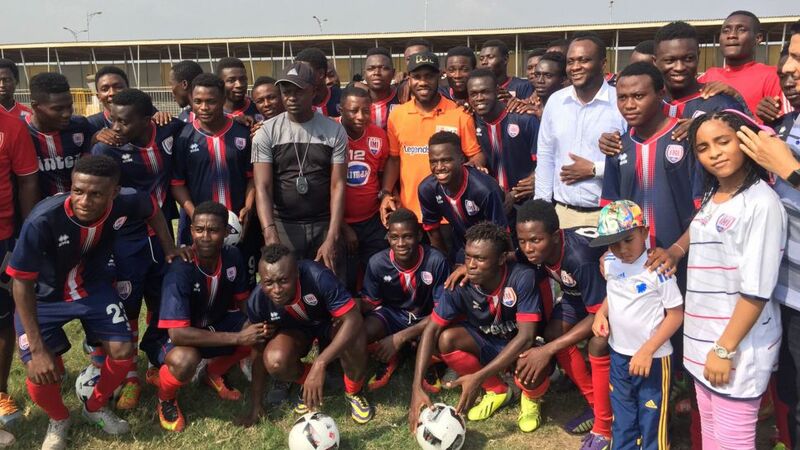 Eintracht Frankfurt legend Jay-Jay Okocha's visit to Ghana continued on Monday, when he visited the academy of International Allies FC as part of the official Bundesliga Legends Tour to promote the league in Africa. Have you readied your Official Fantasy Bundesliga team for Matchday 16? Click here to do so! Okocha was welcomed by a delegation of the Ghanaian Football Association and Kwesi Nyantakyi, the organisation's president, as he arrived at the academy, which has produced several Ghanian internationals. Afterwards the 43-year-old conducted a press conference at which he shared some of his experiences of the Bundesliga with over 50 media representatives from television, internet and radio. In Nigeria, while visiting another academy, Okocha took part in a recreation of his famous goal for Frankfurt against Karlsruhe SC in 1992, when he tied the defence up in knots before finishing past Oliver Kahn.